On my way to attend a meeting this morning at the Arkansas Association of Counties building in Little Rock , I drove by the Capitol. It was a beautiful morning full of sunshine and the promise of spring. While enjoying the view, I thought about the state song we learned when in elementary school. 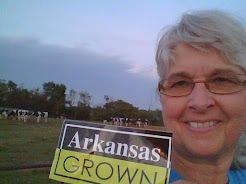 The song "Arkansas" was written by Eva Ware Barnett in 1916.
Who have wandered afar from home. From thy shelter no more I'll roam. And to her let us all give cheer. 'Tis the place I call "home,sweet,home"!